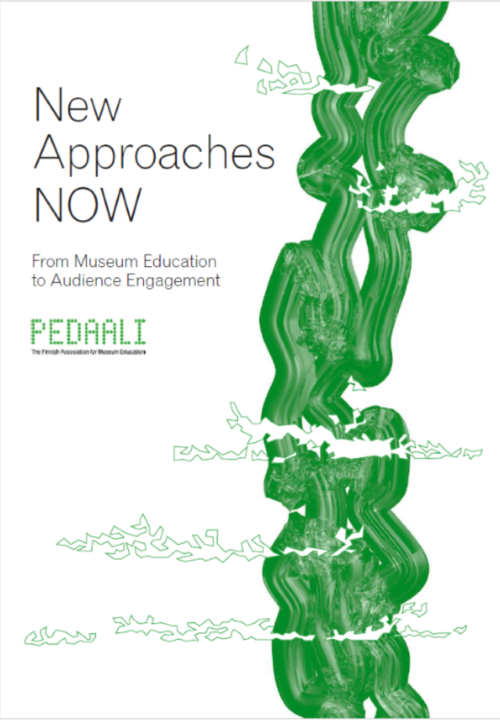 The new publication ”New approaches NOW – from museum education to audience engagement” takes a look at audience development in museums in the 2010s. The texts outline various solutions for the shift in museum operations during the past decade and the rethinking of the social status of museums and the development of new modus operandi. The publication is produced by the Finnish Association for Museum Education Pedaali and is follow-up to an international seminar by the same name in 2015. The publication is in English and can be freely downloaded from http://www.pedaali.fi/en/publications . In many ways we can see that museum education entered a new era in the 2000s. We no longer talk about audience development in the context of museum education activities alone but relating to all areas of museum operations, from collections to customer service. At the same time there is a constant flow of innovative ideas from all over the world on all the things that museums could offer their audiences. Alongside the usual museum audience, there are now potential new target groups. The prominent trends in the museum field are customer orientation, participation, audience engagement and shared expertise. Topical issues, such as the introduction of phenomenon-based learning at schools, the challenges of the welfare society and immigration are practically forcing museums to emphasize their role as a social actor and opinion leader. Changes in the funding of museums are increasing the pressure that museums face to reaffirm their importance among audiences. The articles in this publication deal with various themes that are all related to the museum work of this era. They prompt us to consider who museums actually belong to and who is the target of museum work. They redefine the boundary between museum professionals and museum visitors: at the same time both are makers and experiencers of the museum content. As is the case more broadly in the museum field today, the selected articles emphasize a greater social role and responsibility alongside the cultural heritage work. The authors come from the USA, the UK, Ireland, Sweden and Finland. Marie Bourke is the former Keeper and Head of Education at the National Gallery of Ireland and has served as Chair and member of the Board of the Irish Museums Association. Lynn McMaster is the former President and CEO of the Please Touch Museum in Philadelphia. Suzie Thomas currently works as a university lecturer in museology at the University of Helsinki. Jennifer Shutzberg is an intendent at the Stockholm County Museum and Kaisa Mäki-Petäjä is a post-doctoral researcher at the Department of Art and Culture Studies at the University of Jyväskylä. The publication also includes a case study section where exemplary work models and procedures from the Finnish museum sector over the past decade are presented. All the examples had received the Pedaali Annual Award in Museum Pedagogy over the years 2006–2015. Many of the award-winners have created something new for the Finnish museum sector and the procedures have been widely adopted in Finland. Now they are listed together for the first time, to provide inspiration for anyone working with museum audiences. The Finnish Association for Museum Education Pedaali aims to reinforce the identity of the museum education profession and increase its overall appreciation. The goal of the association is to function as a forum for active and future museum educators, provide training, and work actively in the field to promote museum education. The association has its own publication series ”Pedafooni” and the previous publications can be found on the association’s website.